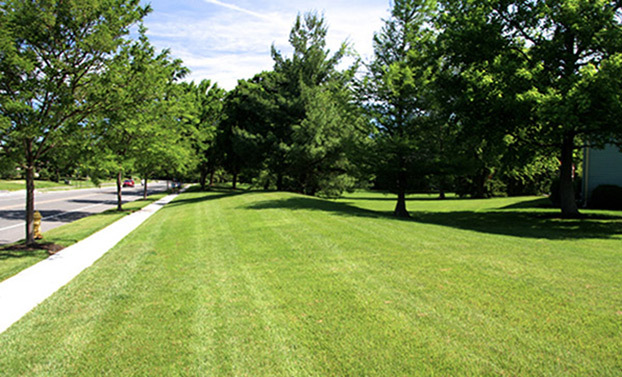 Turf surrounding an office park, condominium or townhouse community, and corporate headquarters usually is one of the most visible features of a property. Visitors, customers, residents, employees, pedestrians and motorists pass by these lawns. We know how lasting those first (and later) landscape impressions can be, and for years we have employed a science-based approach to turf maintenance. Because the best way to grow great turf is from the ground up, for each client we start under the turf, deep into the topsoil in order to learn the nutritional requirements the turf plant needs to thrive and look lush during growing and resting seasons. With soil lab results in hand we add the properly balanced fertilizer application so the client's lawn has micro- and macro-nutrient levels that support a spectacular view from Spring through Fall, allowing the property, as it sleeps in the winter, to spring back in March. There's no guesswork. Levanduski Landscapes Inc. knows beyond any doubt what clients' soil needs. We rely upon certified independent soil laboratories to assay clients' soil for nitrogen, phosphorus, and potassium levels, in addition to Ph. Periodically we conduct these analyses so we know what and when to add to lawns in lime and fertilizer. This scientific approach allows us to know when we are helping clients' lawns and plantings, or where more nutrient support may be needed. Your personal physician insists on a battery of medical tests as part of your physical. We do the same for your landscaping to nurture grass and plantings. Compare our approach to twice-a-year applications of same-chemical-formula, bargain-basement weed control and on-sale fertilizer onto every customer's lawn. In spring we apply a pre-emergent to suppress the germination of a broad spectrum of weeds, the most notable of which is crabgrass. The broad-spectrum weed control will also rid the turf of cold germinating weeds like chickweed that sprout up early in the spring. In late spring our client's lawns receive a second pre-emergent weed control in combination with a balanced fertilizer. A broadleaf weed control is also applied on a spot basis. In late summer a balanced fertilizer is applied based upon the prescription indicated by the soil analysis. To keep the property clear of fall germinating weeds we also apply broadleaf weed controls. And, in the fall a balanced fertilizer is applied.